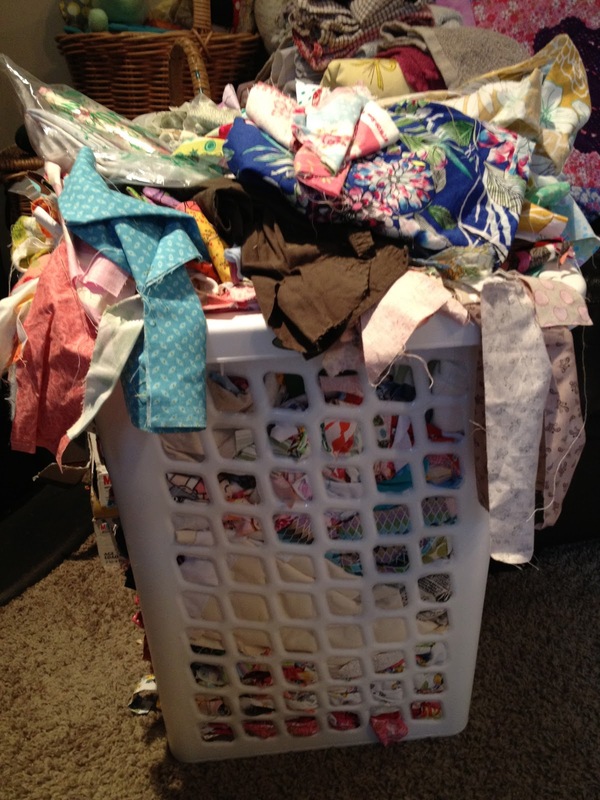 DEB ROBERTSON WRITES....: Scrap Basket Challenge: how many quilts can I make from one basket of scraps? Scrap Basket Challenge: how many quilts can I make from one basket of scraps? and I made loads of things from it, culminating in the Epic Quilt. even though I made this quilt and this quilt. So on saturday I tipped the whole thing out and made 8 piles. This pile of strips for maybe Chinese coin quilts, also the cloud quilt in Molly Makes. Calico and Ivy. 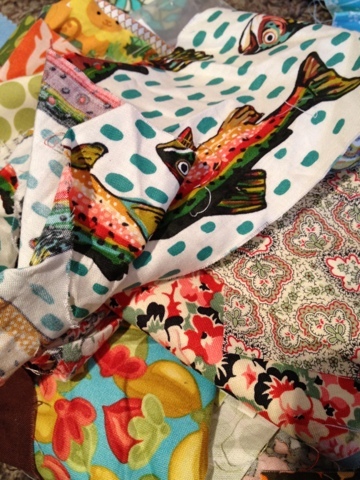 I think this will be the Prints Charming quilt in Material Obsession. Hmm such bright fabric. I think my camera was squinting when I took this!! so this will be just the ticket. Hopefully I finish it before his first birthday. to go with the Prints Charming fabric. Another Prints Charming quilt with these. is one of my favourite things to do. 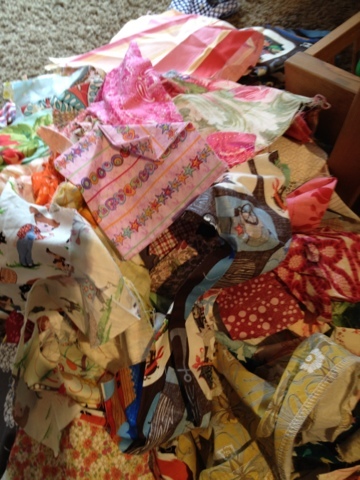 This pile of tiny little scraps is going to be pot holders I've decided. I think I'll buy some proper batting for the pot holders. 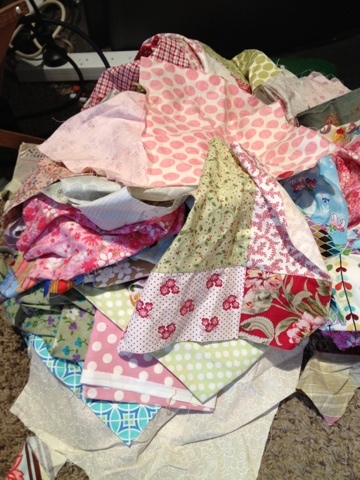 This pile of larger scraps is going to be a Broken Dishes quilt. I think I'll get one print to anchor it as well. I do like that. I think I'll ask the Christchurch Bloggers if anyone wants them. I think there is at least 7 more quilts in this basket really I do. if you want to score some scraps! I'm with you on finishing UFO's - it is my plan to finish 3 quilts this year . . . .
get into those scraps Deb, and Sarah's quilts are just the way to do it!! What an awesome way to use up scraps. I had better not start any more quilts till I finish all the ufo's I have! Good luck with all your plans for your scraps. I sat down and cut all my scraps up into squares from 2.5" to 6" and lots of strips. My cupboard is tidy and I have a head start. Took days to do it though!! 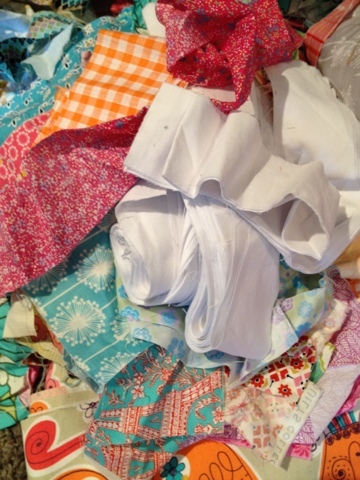 Love your scraps, I cannot wait to see the results. 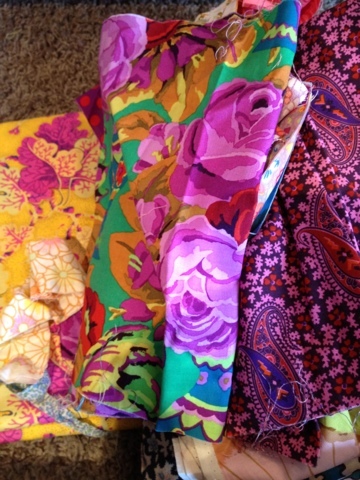 My heart flutters too when thinking of the possibilities with fabric, hard to explain to others who don't quilt. Thank you for sharing your quilts and ideas it is lovely to see how others create. I love scraps. Looking forward to seeing all your quilts. Good luck! 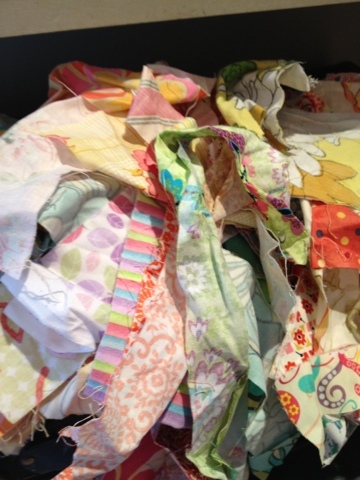 Lovely lovely scraps! I must ask, have you ever considered selling your quilts? Blimey, you've got your work cut out for you there Deb! Good luck with it all..
Wow that's a huge basket of scrap Deb! can't wait to see them turned into quilts.